Nassau Ambulance, Inc. is a not-for-profit organization that was founded in 1952. We were located on Chatham Street with the Fire Department. In October of 2006, Nassau Ambulance, Inc. separated from the fire department organization and became its own entity. 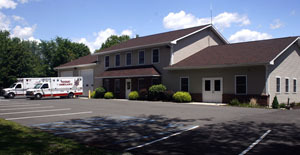 In December of 2009, construction of our own station was completed and Nassau Ambulance Inc. moved from Chatham Street to 498 McClellan Road. Our new building includes a crew room volunteers and staff, and a bunk room for crew members. Future updates are in planning stages, to accommodate our day time staff and overnight volunteer members. The station is also equipped with a large hall and kitchen capable of holding up to 100 people for special events. If you are interested in renting the hall, please visit the Hall Rental page. We are forever thankful of our dedicated past member Frank Celery for seeing the construction of our beautiful station through and keeping the business within our community by utilizing local contractors.